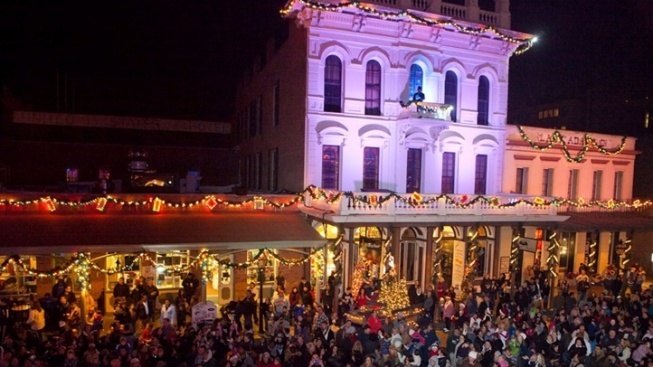 The free evening light show transforms the vintage district, starting the day after Thanksgiving. The free evening light show transforms the vintage district, starting the day after Thanksgiving in 2018. The final date this year? Christmas Eve. SPYING A SOURCE OF ILLUMINATION... while sauntering through Old Sacramento after sundown? You just might expect to see a gaslamp or something flickering, wick-style, inside a lantern. For the historic district does a delightful job in hewing well to its old-timey ways, even as modern lights lend further glow each evening. But the lights get quite modern, and oh-so-spectacular, when the day after Thanksgiving arrives. For that's when Theatre of Lights arrives in the 1800s-era section of our capital city, and that's when the long-established facades of the area's structures take on a new if temporary look. And that look? It springs from light, and technical wizardry, and some neato illuminated artistry, making each building a canvas of sorts. And the cost to see this annual treat, which brings out locals and those in Sactown to enjoy the season? IT'S FREE: And the centerpiece to all of the light-based whirls and twirls? A retelling of "'Twas the Night Before Christmas," or, if you prefer the title it started out with, Clement Clarke Moore's "A Visit from St. Nicholas." It's a beloved 19th-century tale that cleaves well to the historic character of the area, and as it was published before the rise of Old Sacramento during the Gold Rush era, you do wonder if some of the neighborhood's first denizens recited it at their Christmas celebrations, later on in the 1800s. The nightly Theatre of Lights, by the by, takes place at 6 p.m. and again at 7:30, though the Christmas Eve show, the last of the line-up, is just at 6 o'clock.